One of the few chamber orchestras to focus on traditional folk music, the Trondheim Soloists has for 2011 teamed up with one of the most distinct voices on the Norwegian traditional folk music circuit; fiddler and composer Gjermund Larsen. The orchestra and composer began their fruitful collaboration with the celebrated CD/BluRay surround release ‘In Folk Style’ which earned them a prestigious Grammy nomination earlier this year. Founded in 1988, The Trondheim Soloists is one of the most exciting young ensembles performing on the international stage. Through the orchestra’s dedication, commitment and enthusiasm it has quickly established itself as one of the most innovative chamber ensembles in Norway with invitations to collaborate with artists of the highest level across a broad range of genres. As a result after many concerts throughout Europe as well as celebrated concert tours to the USA, Japan and Brazil, The Trondheim Soloists has grown to be an ensemble of international renown. One of the orchestra’s most high-profile fans is no other than Anne-Sophie Mutter with whom the orchestra has toured on a number o occasions. With a solid foundation in traditional Norwegian folk music, fiddler and composer Gjermund Larsen explores a wide variety of genres and styles through playful and convincing improvisation. His tunes range far and wide, spanning the spectrum from blistering fast passages to songs that almost come to an introspective standstill. At the interception between tradition and innovation, Larsen and his companions represent a veritable cornucopia of genuine musicality. 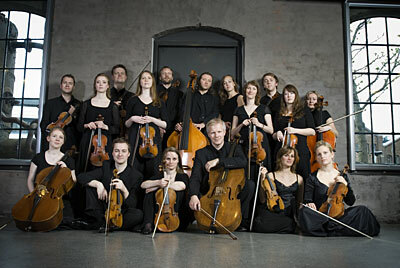 The Norwegian State Academy educated fiddler and composer is a member of ensembles Majorstuen, Frigg, Brødrene Larsen, Ragnhild Furebotten trio and Christian Wallumrød ensemble. Following the successful release of his trio’s debut album ‘Ankomst’ (which won a Spellemannspris Award), the Gjermund Larsen Trio returned with a follow-up in 2010; ‘Aurum’ picked up where the predecessor left, giving the listener a set of skilfully composed melodic tunes played with finesse and a keen sense of artistic detail. Larsen’s proper debut as a composer came in the form of the applauded work ‘Brytningstid’ which was commissioned by the Telemark Festival in 2006. Since then the celebrated composer has written a number of works for smaller ensembles but his commissioned work for the 2011 Førde Festival marks Larsen’s debut as a chamber orchestra composer. The Førde premiere also features Gjermund’s older brother Einar Olav Larsen, a fiddle player equally adept on his instrument as his younger sibling. Critics call Gjermund a uniquely poetic folk musician distinguished by the gentle warmth of his tone, the natural lure of his melodies and the broad range of his poetic sensibility: from catchy dance tunes to tranquil meditations. Even amidst the brilliant revival of Norwegian folk music, Larsen stands out; his repertoire of songs so rich and diverse in emotion and so beautiful and well tempered in execution that the whole horizon of Norwegian folk music seemed to have been broadened. Fusing those talents with the vitality and professionalism of the Trondheim Soloists creates the foundation of a night that looks set to be one of the festival summer’s true highlights.